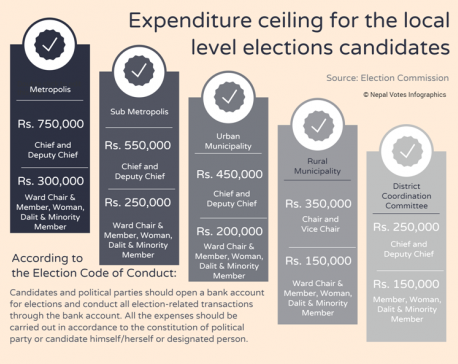 POKHARA, May 9: The Election Commission (EC) has set ceilings on expenditures that candidates competing in local elections at various levels can make. According the directive, mayoral and deputy mayoral candidates of a metropolitan city have been given the maximum budget ceiling of Rs 750,000. The ceiling that came as part of the Election Code of Conduct has been received with criticism from candidates and commentators. The ceiling, commentators noted, won’t even suffice for organizing door-to-door visits, mass meetings, internal party meetings, let alone printing pamphlets and flags, among other necessities. 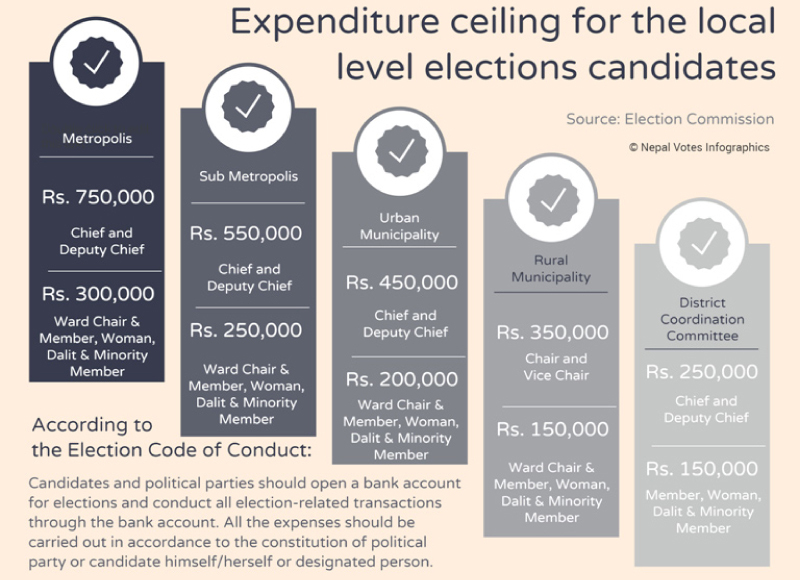 According to directive, mayoral and deputy mayoral candidates for a sub metropolis can spend a maximum of Rs 550,000, similar candidates for an urban municipality can spend a maximum of Rs 450,000 and that of the rural municipalities can spend a maximum of Rs 350,000. The directive also bars chief and deputy chief candidates of district coordination committee from spending over Rs 250,000. “The candidates who cannot spend in the campaign have very slim chance to win. Money counts a lot during such events. They have to spend to get the attention of the mass,” he remarked. “And if a candidate does not have sufficient funds, he or she might loose just because of that weakness. Such crunch hits independent candidates the most,” he added. Dahal further noted that luring the voters is not easy. The culture of spending considerably for election is not a new one and it is in fact popular among people. Throwing party to cadres and mass is not taken as ‘extravagant’ expense. In fact, that is taken as obvious. “When this is the case, how can one do with the bracketed amount? It’s tough for those unable to spend,” he stated. As candidates depend solely on party cadres or volunteers, tracking all expenditures is very hard to segregate election related and unrelated expenditures. Party cadres and volunteers, who work round the clock for the campaign, have to be paid. “Whether they spend the funds for election or not is something you cannot question during the campaign. It is a matter of trust. Whatever is spent from cadre’s pocket has to be borne by the candidate,” he further elaborated. If the candidates do not ‘happily’ bear the cost of their cadre and volunteer’s travel, snacks and gatherings, who will rally support for them? Dahal questioned. “That’s normal and that has to be willingly borne by candidates. They cannot raise question if they want to keep their chances of winning,” he stated. 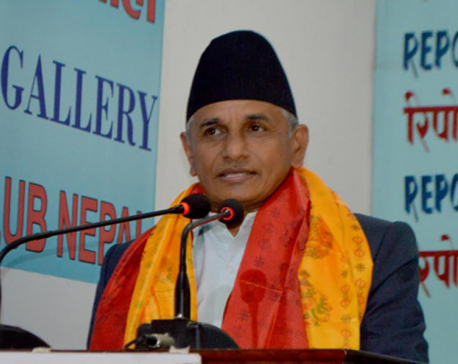 A candidate for ward chief agreed to Dahal, while preferring anonymity citing the Code of Conduct. The candidate said that at least, Rs 3 million is needed to contest election at the ward level, let alone at the municipality or the metropolis level. “Dozens of party cadres work their heart out day and night. The amount that the EC has put as a ceiling does not suffice even to feed them, let alone traveling and other expenses,” he added. The candidate said organizing motorcycle rally, mass meetings, gatherings are very expensive. “For a successful election campaign you need volunteers and cadres who work towards garnering support for your candidacy. And if you are not making them happy, how can you expect to win?” adding further that campaigning in rural areas is even more expensive.